Doors open at 11 am. Program begins at noon. We are honored to welcome Americans for the Arts’ Vice President of Research and Policy Randy Cohen and Louisiana Lt. 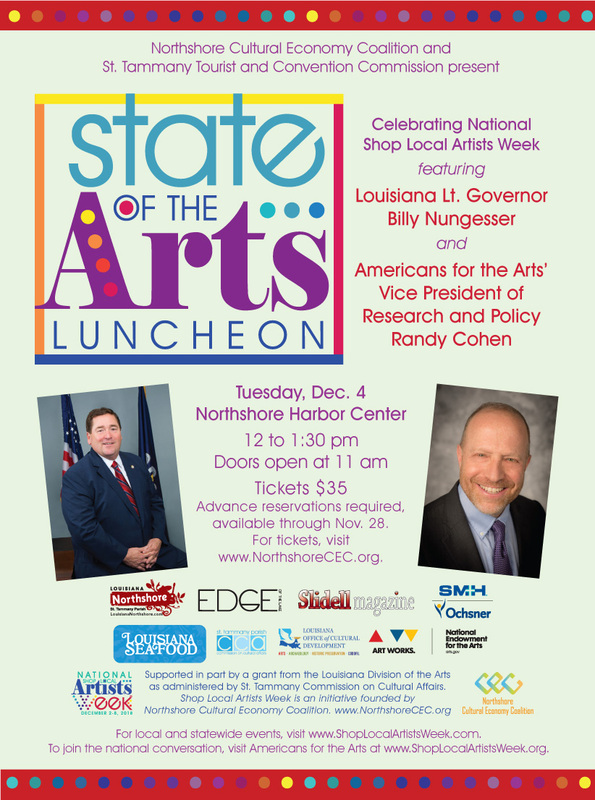 Governor Billy Nungesser to a State of the Arts luncheon in honor of National Shop Local Artists Week. Presented by Northshore Cultural Economy Coalition and St. Tammany Tourist and Convention Commission, the State of the Arts luncheon will feature delectable Louisiana fare, a showcase of arts organizations and festivals with significant contributions to the cultural economy and live entertainment by saxophonist Greg Worthington. Enjoy a delectable menu starring Louisiana seafood, including shrimp, corn and crab bisque, spring mix salad, Eggplant Napoleon – fried eggplant medallions topped with crabmeat stuffing and crawfish etouffee, buttered parsley potatoes, chicken scampi, topped with savory bordelaise and option of sautéed shrimp, mushrooms and green onions on the side, smothered green beans, dinner rolls and bread pudding with rum sauce. Tickets are $35, available via the link below. Limited seating available, so early reservations are recommended. Reservation deadline: Wednesday, Nov. 28. This State of the Arts Luncheon is a Shop Local Artists Week event.